Chevy Stevens has recently become one of my favorite authors, with her psychological thrillers keeping me entertained and guessing throughout. Never Knowing was definitely one of my favorites that I’ve read by her so far! “All her life, Sara Gallagher has wondered about her birth parents. As an adopted child with two sisters who were born naturally to her parents, Sara never had an ideal home life. The question of why she was given up for adoption has always haunted her. Finally, she is ready to take steps and to find closure. But some questions are better left unanswered. When Sara manages to locate her birth mother, she is met with horror and rejection. It’s not long before Sara discovers the devastating truth: Her mother was the only victim to escape a killer who has been hunting women every summer. For decades. And he shows no signs of stopping anytime soon. What if murder is in your blood? The only thing worse than Sara finding out about her father is him finding out about her. But now that the door to her past has been opened, is it too late?” This book asks whether it is better to leave the past alone, or to open the door to knowing things that might be better left unsaid. Sara narrates the story via conversations with her therapist, and her problems began long before she began looking into her birth parents. She had a difficult childhood, always feeling as if her father did not love her as much as his biological children, and often fighting with her younger sister. Because of her previous issues, it is hard for her to tell what is paranoia and what is actually something to fear. It is hard for the reader, along with Sara, to know who to trust. There was definitely some creepiness involved with Sara’s new relationship with her biological father, but not enough to turn me away from the book. I noticed that this book has some negative reviews on Amazon, but I really enjoyed it, reading through it very quickly as I wanted to know what would happen in the end! 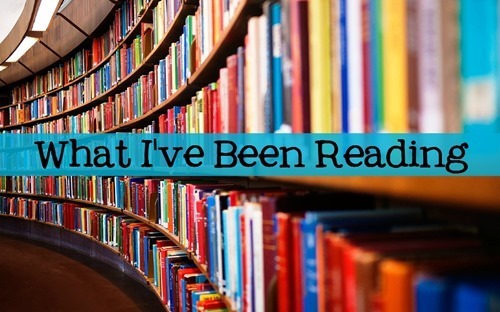 You may have noticed that I made a new graphic for my “What I’ve Been Reading” posts. I used to link up every week with Book Club Friday, but it seems as if that link-up is no longer active. If there is anyone that might want to continue to link up, I’m happy to host the link-up here! Just let me know!